If you are a fragrance aficionado like yours truly you’ve probably amassed more bottles of perfume than any person has a right to own. Not only are full bottles usually expensive, they take up space. Granted, some of the bottles in my collection are so gorgeous that I adore the bottle as much as the juice that’s inside but that’s not always the case. You’ve reached the stage in your perfume obsession when you need to start considering decants. 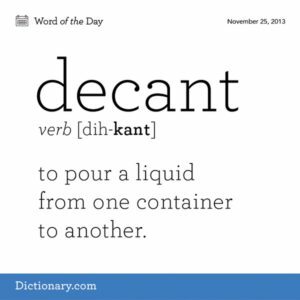 The word “decant” is actually a verb taken from the noun “decantation”. You’ve probably heard the term used to describe transferring the contents of a wine bottle into another receptacle (decanter). With so many of our fragrance words borrowed from wine (and music) it’s yet another on the long list. The word “decant” is exactly what it sounds like; perfume lingo for a small amount of perfume poured from a bottle into a smaller container. Thanks to bloggers and vloggers, perfume decanting has become almost a sacred ritual among the fragrance-obsessed. Think of it as a cross between a perfume sample and a full bottle. If I were a truly rational person (which I’m clearly not), I’d start with a perfume sample, if I love it then move on to a decant and if it’s one I can’t live without I’d buy the smallest full bottle size available. That’s not the way it always goes but has worked on occasion. Perfect for travel – Rather than lugging around your heavy 50 or 100ml bottle, a 10 ml bottle (or even 2 or 3 of them) will easily get through security in your carry-on suitcase. 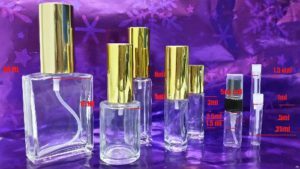 Great for Perfume Swapping – I’ve talked here about the popularity of perfume swaps as a way of trying a perfume without investing in a full bottle. Decants are way better than full bottles if you’re not sure about it or haven’t tried it. Affordable Goody Bag Option – For a friends get-away or anytime you host a party, decants are a brilliant idea. Don’t stress about whether or not they’ll love the scent. Focus on the fact that most people appreciate a personal touch rather than a generic goody bag. The fact that you’ve selected your fav and hand-poured it will make it even more memorable. If they don’t love it who cares? Relatively inexpensive – You’ll save $$ yet still get your fix. Okay, so if all of this sounds intriguing enough to want give it a go, there are a number of different ways to make your decant. You can go the route of rollerballs or spray bottles. It really depends on your personal preference. There’s also the mini glass vials which are more for sample size than decant. There are many online sites that sell both in bulk. Luckily, not all have high minimums so you won’t be stuck with boxes and boxes if you decide it’s not your thing. I’ve tried a few different ones from several sites over the past couple of years. The spray bottles from Travalo that I found on Amazon didn’t disappoint and I’ve been very happy with rollerball bottles from SKS. Rollerballs – I’m a huge fan of roller-ball bottles as I talked about here. The apparatus is basically a glass bottle with a plastic cap and small plastic ball that fitted into it. The cap and ball snap into the glass bottle and a screw-on cap is included. Voila! Spray bottles – Although you can find these at basically any beauty supply store (even at CVS) it’s way cheaper to buy these online. SKS has really good prices for this option. Glass vials – They’re mostly sold in 1 or 2ml sizes, are very inexpensive but a little tricky to fill. You can find out more about bottle sizes here. If you are transferring perfume without a sprayer into a smaller bottle or vial, the process is even easier. The most common way to do this is using a decanting rod or a pipette. I prefer the plastic pipettes and I’ve found the best prices are on eBay. The biggest thing to remember when decanting is to properly label your bottles. Don’t make the mistake of just thinking that you’ll be able to sniff and identify what’s inside them later. 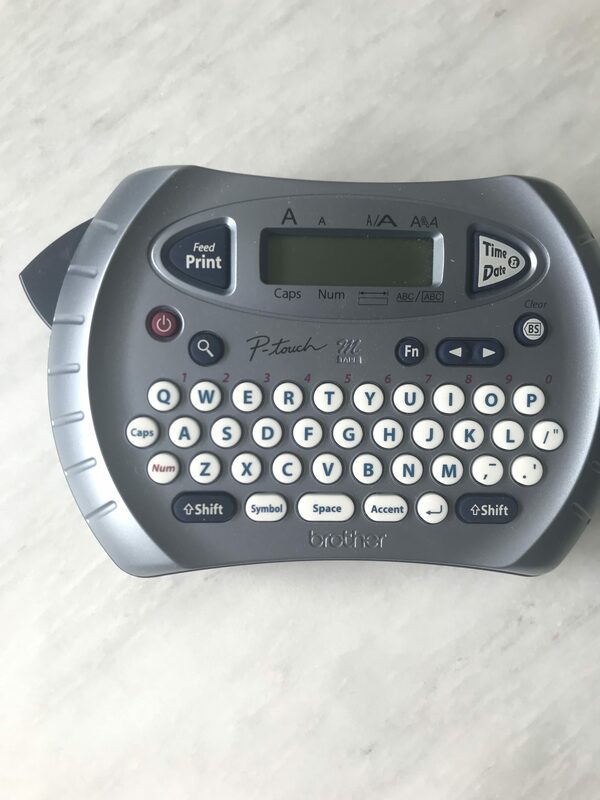 You can either write the name on a label or invest in a label maker (my preferred method). 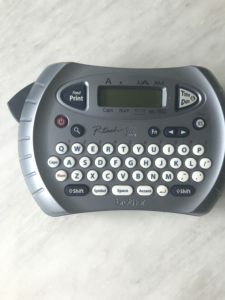 I recommend attaching the label after filling the bottle, especially if you are if you are using a handwritten label. Ink has a nasty habit of bleeding if it comes into contact with any spilled perfume. There’s no point of bothering with a label if you can’t read it. If you plan on shipping your decant it’s a good idea to wrap the bottle joints in Parafilm M (a kind of wax used in scientific labs and sold on Amazon). Although it’s not exactly rocket science, learning to decant takes some practice and a steady hand. There will likely be spills along the way and things can get messy. Some people like to wear thin disposable latex gloves for this reason. Work in a room that’s well-ventilated and dress appropriately, meaning wear something you wouldn’t mind getting stained. Keep a towel handy as well. Leave time for a shower afterwards. Start with one of your less pricy perfumes before attempting to decant a Creed or Clive Christian. 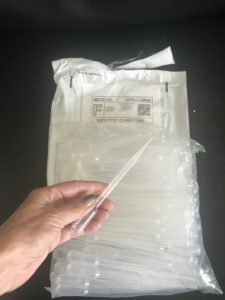 It’s a good idea to store your decants in a zip-lock plastic bag, especially when traveling. Hope this has inspired you to make some samples/decants of your very own. If there’s anything you’d like to add, share your advice in a comment below! This entry was tagged perfume bottle sizes, perfume swapping, rollerballs. 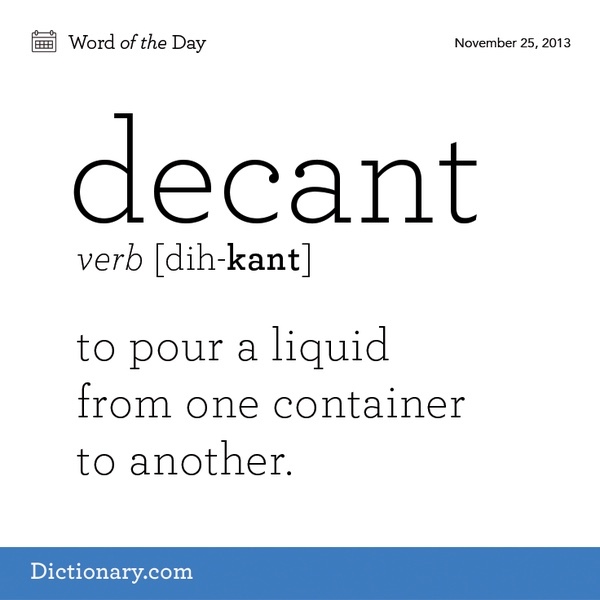 Didn’t quite ask what a decant is but learning something new is always great. It’s cool that there’s an actual term for transferring bottles of perfume and I assume cologne into smaller bottle sizes. It’s great that this option exist and it sounds pretty simple. Especially good for travel since large quantities of liquid can’t pass security. Just out of curiosity, do people ever mix perfumes together in these small amounts to test them? What an interesting question though I’m not quite sure I even understand it. If you mean do people ever combine two or more perfumes in a decant (which is what I think you’re asking) I’m guessing that it’s probably been done but I definitely don’t recommend it. The far better approach for those who like to layer perfume is to make decants of each. Decants are not only excellent for traveling with your favorite scents, but also a great way to save money and the environment by using less plastic! I am all for that! I really enjoyed reading this article and I am always looking for different apparatuses to make my essential oil sprays into. I’m all for less plastic too. Our planet has way too much of it! Some people do use plastic bottles for decants but I prefer glass. I’m also a fan of essential oils so would love to hear more about the sprays you’re creating! Your article was very inspiring and I am not a stranger to this method. Back in the day when I started, 30 years plus, I didn’t think of the term decanting, but I found it fun and useful. What I did in the old days, I used an unused insulin syringe and yes, I also used some latex gloves and I only had small plastic vails, but it did the job. Your advice though is much better and I would love to have my own roll-on bottle, never thought of it before. You clearly are a woman ahead of your time and I love that. My husband and brother are both Type 1 diabetics so I am quite familiar with insulin syringes (although they both have a pump now so thankfully the syringe is not a regular thing). There are actually syringe-type devices that some people use for decanting but I find the pipettes easy to use and actually never tried them. And yes, rollerballs are great and you should give it a try. I’ve only heard of decants for wine and have never thought of this type of a method for perfume. It makes sense though because perfume costs so much these days, especially niche perfumes which I’m just starting to get into. And yes, most of them cost a fortune! It sounds like a big ordeal to decant but maybe it’s not as complicated as it sounds. It’s really not terribly complicated but takes some practice. I didn’t include any YouTube videos about how to go about it but there are so many out there and maybe watching one or two will be helpful before you give it a go! I love perfume but am just getting to know about decants. I must say that I learned a lot from this writeup. Saving money and good for traveling works for me. Thanks for the links to the sites and I am going to check this whole thing out! It really depends. Like I said it’s not rocket science but it takes a little getting used to. Some bottles ar easier to decant from than others. Be prepared to spill some in the beginning and don’t stress about it.